CK Power assists all types of utilities providers with both prime power and standby generator solutions. For providers of gas, electric, telecomm and water services, our backup generator solutions ensure that, when it comes to power, we’re online even if you’re not. Whether it’s getting gas from the mine to the consumer, or making sure you can handle the overflow when rivers and creeks are on the rise, our generator sets power pumping equipment for utilities providers when they need power most. 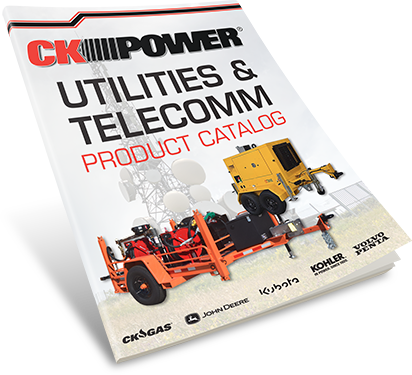 For the telecommunications sector, CK Power is an experienced provider of both stationary and mobile backup generators for when disaster strikes. As a proud supplier of Kohler backup generators, we can ensure that cell sites stay online even in severe weather. And for extreme situations where multiple cell sites may be knocked offline, our towable generator equipment is capable of powering even the toughest of recovery efforts. When CK Power is in charge emergency power generation for your telecom operation, you’re covered even in the most extreme circumstances. Our prime power and backup solutions are capable of keeping utilities and telecom providers online, even when there’s trouble with the grid. To make sure your customers are never disappointed by an outage, get in touch with CK Power today.